« At Risk for Cancer? Herbs and spices have historically enjoyed a rich tradition of flavoring and enhancing the foods we eat. They have also been used for their medicinal properties and are being studied for their ability to fight off cancer cell survival. Since as a society we are starting to turn to natural substances for solutions to disease, herbs and spices are a natural place to start. Preclinical studies reveal that herbs and spices have multiple anticancer characteristics. Herbs and spices such as cumin, garlic, rosemary, thyme, oregano, turmeric and others have shown remarkable antioxidant activities and are being researched for natural antioxidants. Garlic may be the most well-known of the bunch and many people are already aware of the benefits of eating garlic. Research has proven that garlic is one of the best foods to eat for cancer prevention, working to slow or stop the growth of tumors in prostate, bladder and stomach tissue as well as preventing cancers of the skin and lungs. Garlic contains allyl sulfides, powerful and helpful antioxidants that also work to lower cholesterol and thin the blood. Studies have shown that these same group of compounds also have anticancer properties. Recent research, “Iowa Women’s Health Study” revealed that women who ate garlic regularly has a lower risk for colon cancer. This is one herb you want to eat plenty of! The essential oil of thyme (derived from thyme) is rich in thymol, a powerful antiseptic, antibacterial and strong antioxidant. All the members of the mint family (thyme is one) contain terpenoids…recognized for their cancer preventive properties. Both rosmarinic and ursolic acids are major terpenoids that thyme provides that possess anticancer properties. Other spices such as turmeric contain an active component called curcumin…a powerful antioxidant very similar to Vitamins C and E. Acting on lymphocytes and other immune cells, it has wide ranging effects on the body’s immune system and wound healing ability. Curcumin has also been found to arrest by spread of cancer by killing off cancerous cells and disrupting tumor blood supply when tested in a laboratory for human studies. Cucum, parsley, fennel and dill all belong to the parsley family of herbs and spices and contain some unique phytochemicals such a phthalides and polyacetylenes which show cancer-protective activity and anti-inflammatory properties. Studies are also revealing that ginger is another highly effective spice when it comes to cancer prevention. No less than fifty antioxidants from the rhizome of ginger have been identified. Gingerol another active compound found in ginger, acts as an antioxidant and has proven to suppress tumor growth, shut off tumor blood supply and kill off cancerous cells. As an added bonus, ginger also helps to fight nausea for many individuals. Cayenne pepper contains capsaicin as the main ingredient and is presently used to treat everything from osteoarthritis to cancer. Capsaicin promotes apoptosis, the natural cycle of programmed cell death. Cancer cells naturally fight against apoptosis and if not held in check, these cancer cells eventually overtake the body with cancer. Studies have shown when cancer cells are treated with capsaicin (from the cayenne pepper), the chili pepper compound attacked the tumor cells’ mitochondria, the chemical that creates energy in the body. 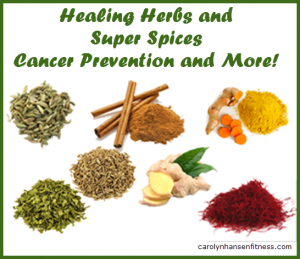 Bottom line is this: Herbs and spices can play an important role the prevention and growth of certain diseases just as other dietary factors play an important role in our health and the prevention or development of certain diseases. Break out the spices and sprinkle to taste! And, don’t forget the garlic! Take my quick “Cancer Risk Test”…to find out if you have an invisible threat hanging over your heads.